Ordinary Hero Coaching — A Hero's Journey or Just a Military One - What Game Are You Playing? A Hero's Journey or Just a Military One - What Game Are You Playing? In the same way that a football team measures their progress toward the end zone in terms of yards, we measure our progress through the military in terms of days. Back when I was a plebe (a freshman cadet in the West Point vernacular) counting down the days to specific benchmarks was among the daily knowledge requirements. We celebrated the 500 and 100 day milestones before graduation, but graduation itself wasn’t the end. It was the transition from cadet to military officer and the beginning of an even greater responsibility and challenge as a leader in the army. Graduation and commissioning were merely a new set of downs in this game of life. I remember different versions of the days throughout the course of my military career. On each deployment, we counted down the days before returning home. We commemorated these experiences with service stripes in the same way college football players put stickers on their helmets to recognize outstanding play. When men and women decide to separate or retire from the military, we begin another countdown. This is the countdown to transition from the military. The obvious temptation is to mistaken separation or retirement as the final goal - the end zone - so to speak, but it is not the end. Depending on which game you are playing, it is only the halfway point. It is merely the 50 yard line. It all comes down to what game you're playing. If you view military transition as the end of the game, then you accept that your best days are behind you. You choose to walk off the field with the ball at midfield. If you view your military experience as just one part of a broader journey - a Hero's Journey - to achieve lifelong goals with a broader impact of service to society, then you still have half a lifetime to go. You can't be the soldier anymore, but you get to become something more. By exploring the anthropology and deeper nature of civilian reintegration in the context of the Hero's Journey, perhaps you can develop your game plan to achieve your lifelong goals. What we label as “Military Transition” is a modern concoction. Contemporary institutions created it from a need to describe a process within the bureaucracy to formally remove men and women from the manning rosters for the Department of Defense. This is how the system moves men and women from the status of service member to veteran. Over time, this program evolved for two reasons: (1) To determine a service member’s qualification for compensation and ongoing benefits as a result of their military service, and (2) to minimize the risk of unemployment compensation that the Department of Defense must pay for transitioning service members who can’t secure new employment. Military transition was begotten from the bureaucracy to service the bureaucracy. The process of returning warriors to society existed long before the creation of federal institutions and government bureaucracies. Citizens from within the community assumed the responsibility to welcome home and integrate warriors back into the social order. Through a combination of rituals and ceremonies, the citizens of the tribe facilitated a form of healing and spiritual evolution for successful integration back to civilian life. Civilians armed, equipped, and trained their warriors, and then they helped them repurpose their experience for the wellness of the individual and the benefit of the tribe. In primitive cultures, the warriors returned from the battlefield and ascended into leadership roles within the tribe. They became the chieftains, wise elders, and statesmen of the social order. They assumed greater challenges and responsibilities to improve the whole of society. They were not considered “Soldiers” - or more appropriately “Warriors” - for Life. They fulfilled a greater purpose through a different, more empowering identity. The lesson we can take from more primitive examples of reintegration is the imperative to create a path of continued growth for the long term health of the service member and broader welfare of our society. What is a Hero’s Journey and Why Do I Care? Joseph Campbell provided a timeless model to describe the psychological and spiritual journey common among warriors and independent of culture or ideology. The battlefields, tactics, and weapons might be different, but the experiences are largely the same. Warriors answer a call to service and cross the threshold from the innocence of what they’ve come to know from their childhood and begin a new adventure in an “unknown” world. Warriors immerse themselves in the culture and practice of warfare. This unknown world is unburdened by abstract constructs of civilized society. Along the journey, the warrior undergoes a series of trials. In combat, the psyche is assaulted by impulses from across the spectrum of our humanity. The full-limit of emotions are experienced in the superlative. Many of the attributes and aspects of the self that the warrior brought with them along this adventure will not survive the many trials they might face. Evolutionary growth is an essential component of forward movement along this journey. When it comes time for the warrior to return home, they must remove their armor before society can integrate them back into the fold. Homecoming rituals and ceremonies were meant to shed the detritus and filth from the battlefield to achieve a higher state of being. The warrior archetype remains in the unknown world, and the individual becomes something more to step back into society. The warrior's reward along the journey is self-actualization. Campbell describes this evolution as an initiation. In the spiritual context, initiation achieves a higher order of consciousness - a higher state of being. Your return from the battlefield is not a redeployment in the conventional sense, but a return to what we accept as ordinary bearing the gifts of wisdom and experience. This is the reason why the warriors ascended into leadership roles across primitive societies. Society benefited from their leadership. The challenges they faced were preparation for a more empowering and impactful path beyond the warrior caste. Joseph Campbell spoke about this journey in the context of separation-initiation-return. You may recognize this cycle as life-death-rebirth common across stories from mythology or instruments of faith from religions around the world. 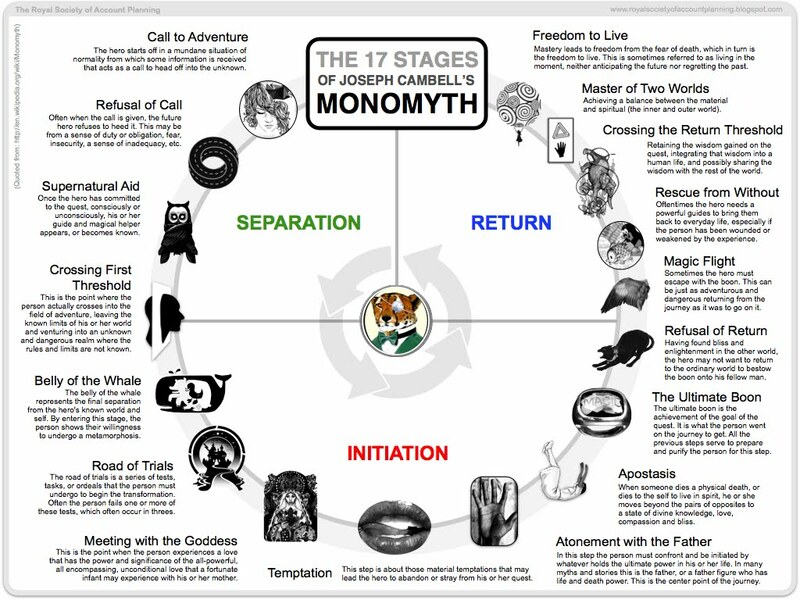 The universal aspect of this model is the reason why Joseph Campbell famously characterized the Hero’s Journey as the monomyth. In the context of the military, we separate from the innocence of our childhood and the known world, endure the trials of military service and exposure to most difficult and arduous aspects of our humanity, and return to society with the power and wisdom to improve the social order. This is the true nature of the game. This is your Hero’s Journey. The use of the words like “retirement” connote a sense of finality, but the truth is that the military leader who retires after 20 years of service still has an entire half of life before them. The Hero's Journey is a model of lifelong growth, and your journey through the military is just one part of a larger cycle. In the context of the football metaphor, it represents crossing midfield along a path toward the end zone. When you acknowledge the anthropology of the warrior caste against the broader context of the social structure, you begin to understand why statements like “manage expectations” or “take a step back” simply don’t work. They never have. They defy the imperative for continued growth. You also appreciate how the process of transition from the military is so much more than a job placement program. Think back to how your journey through the military began: We all had an inspiration - an intrinsic calling - to begin our service through the military. The challenge is how to repurpose that experience into an empowering role when you return to society.